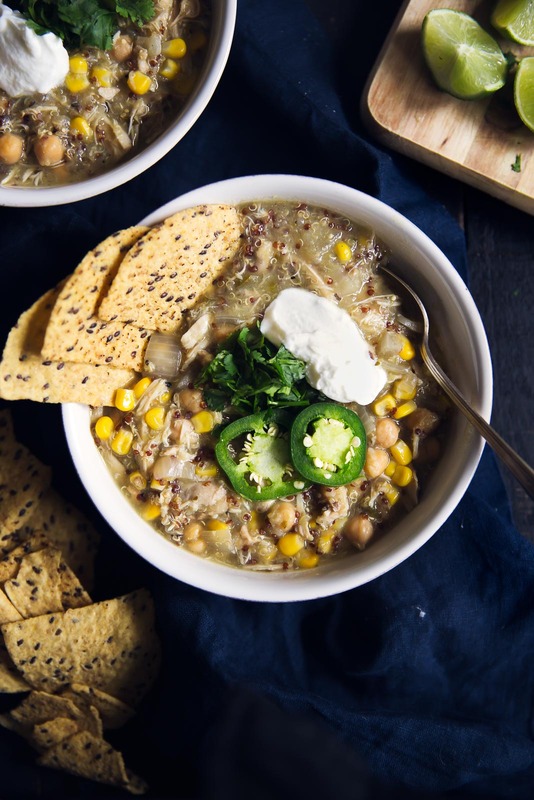 Trust me, this slow cooker meal filled my belly up on many cold February nights. It’s the easiest recipe to throw together because there’s no cooking on your end. Cumin, garlic and peppers simmer with chicken, chickpeas and quinoa all day until the chicken is tender and ready to be pulled apart. Of course, no chili is quite complete without a little avocado or guac on top. My favorite way to make an easy guac is to smash 1 avocado with a fork, then add a little lime juice, chopped cilantro and onion then salt and pepper to taste. You don’t need to get fancy with your guac all the time (unless you really want to). Buy 1 or 2 avocados a week and enjoy easy peasy guac for two people! As far as the soup goes, I made this for Tony and even though he claims to hate quinoa (he calls it kin-oh-ah), he loved this recipe and even went back for seconds. Actually, he always goes back for seconds. And you might too. I hope you love this soup as much as I did! If you make it, be sure to leave a comment below and/or snap a photo and tag #ambitiouskitchen on Instagram so I can see your creation! 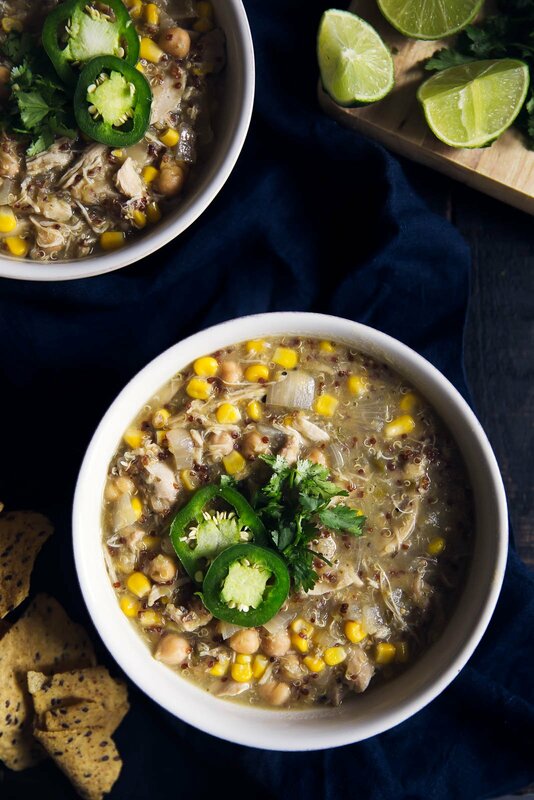 A healthy slow cooker salsa verde chicken chickpea chili with quinoa & lots of lime flavor. Serve with tortilla chips, avocado & greek yogurt! Add everything to a large slow cooker and stir well to combine. 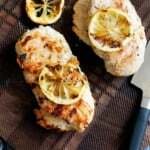 Once done cooking, remove chicken with a slotted spoon and transfer to a cutting board; shred chicken with two forks then transfer chicken back to slow cooker and stir. Taste and add salt and pepper to your liking (I don't find that adding either is necessary due to all the flavors happening). 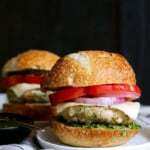 Serve with fresh cilantro, avocado, tortilla chips and greek yogurt or sour cream. *I used Trader Joe's Salsa Verde, but you can use another mild green salsa (salsa verde) if you'd like. Feel free to leave the jalapeno out if you don't like a little hint of spice. 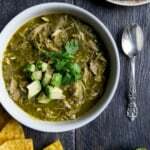 35 Responses to "Slow Cooker Salsa Verde Chicken Chickpea Chili"
I am ALWAYS up for a slow cooker chili recipe! Yum! This is perfect for a quick and easy dinner! 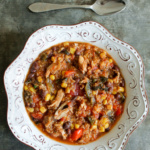 I love salsa verde chicken and make a chili like this regularly. Yum! Trader Joe’s Salsa Verde is my absolute fave! I know we’ll get another storm in Chicago before the month is over so this is going on my to-make list! It’s “chilly” here tonight and I could totally go for this!! Holy dang this is perfection. One question. Chickpeas and my tummy are not exactly friends. What would you suggest? Leave them out and replace with more chicken? Quinoa? Or not even worry about replacing? This looks like just the thing to cozy up on any night of the week! 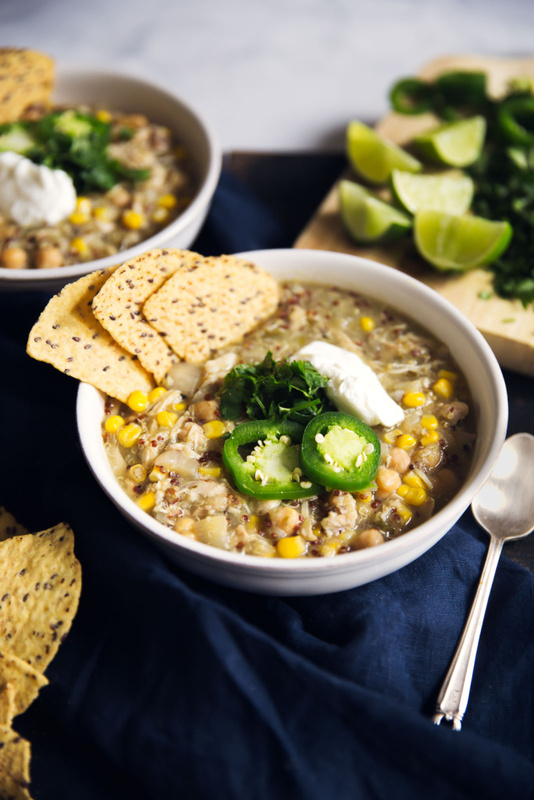 Chickpeas are rarely in chili recipes and I love that you added them to this. It looks and sounds fab! This was so hearty and delicious. I used black beans and topped with shredded Parmesan cheese, soooo good. My husband loved it too! Thanks for sharing! I made this today after thinking about going back to it so many times and it was worth the wait! so delicious and so easy, thank you! 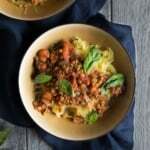 is there any version of this recipe that isnt using a slow cooking process? I made this last night and it was delicious and so flavorful. I replaced the chickpeas with black beans—and it was fantastic. Thank you!! Made this last night & the fam absolutely loved it! DH said it was one of the best chili he’s had. Loved all the flavors. Will definitely make this again! It was yummy & filling. Teenage son almost couldn’t go back for seconds, he did but not a huge bowl since it was so satisfying! I just made this for dinner. It was divine! It is the best slow cooker meal I’ve made…ever! 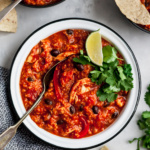 I am always looking for good slow cooker recipes that can be adapted to cook for a long work day. I subbed 1/2 cup of dried chickpeas (soaked overnight) and 32 oz chicken stock. It turned out great even after 10 hours in slow cooker. 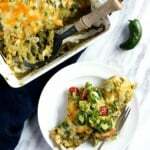 My family has really enjoyed this recipe! I want to make it for a friend as a freezer meal. Do you think it would work to put all the ingredients in a freezer bag without cooking it so that she can dump it all into her crockpot and cook it when she’s ready? or should I cook it and then freeze it for her? Thanks so much! This may be an obvious question but does the lime juice go into the crock pot or for a garnish after served? I’m new with quinoa , do you rinse before putting in the slow cooker? Thank you. It’s not necessary, but you can if you’d like! This is a delicious recipe. I made it this week and it was perfect. Thanks for the great idea! Oops! The jalapeño does add a kick of spice – next time feel free to omit it! This did awesome in the Instant Pot. My chicken thighs were frozen. Threw everything in (except the beans because they would’ve become non existent) and cooked on high pressure for 30 mins letting the pressure naturally release. Took out the chicken to shred and put the beans in. This is delicious! This recipe comes together so easily and the end result so delicious! I’ve made this 2x in the last month and it is the perfect answer to avoiding the depressing desk salad. I find the jalapeno really mellows out in the slow cooker so I added a 2nd pepper and top with red chili flakes or sriracha (admittedly, I love spicy food so I wanted to amp it up). I think adding additional lime juice to taste at the end creates a perfect balance as well. No sad desk lunches here! Glad you found this one, Sarah 🙂 Feel free to keep the seeds in the jalapeño too for some extra spice. Love the lime!